In this day and age you'd have thought "bigger is better". Why not store album artwork as large as possible, when storage is getting cheaper and displays getting larger, sporting higher resolutions? Generally, it is best to store album artwork in as high a resolution as possible. But practicalities often intrude; many music players still have limits on the size of album artwork that they will display. It effects different types of music player. It's common to have maximum resolution or data size requirements on in-car vehicle players, and even mainstream home hi-fi systems have restrictions. There are two types of size to consider. The most commonly talked about is resolution; that is, the number of pixels, expressed by width and height, that make up the image. The second type of size is the data size consumed by the image. This is expressed in bytes or a multiple thereof. Experiment with what the image format offers, e.g. increased compression. In bliss you specify how your music library should be organized in terms of rules. With respect to artwork size, that means defining maximum (and optionally minimum) resolutions, maximum data sizing, or a set of image formats that images should be stored in. 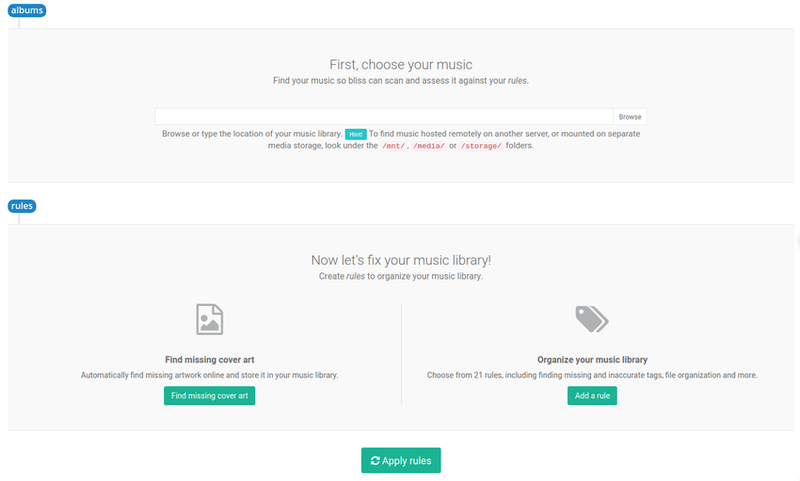 The first thing to do is complete the Music location field by giving bliss the path to your music library. If your music library is stored on another computer, e.g. a NAS or music server, check this FAQ. Now, let's say you wanted to store artwork with resolutions no larger than 500x500, a maximum data size of 256KB and you wanted to make sure all your artwork was JPEG to ensure it was compressed. This is a hypothetical example to show all settings, in reality you'll often only want to do one of these things. It's up to you if you want to allow bliss to Shrink art automatically. If you're unsure, allow it to perform a manual scan without this setting enabled, then observe the results after clicking a fix to shrink album art. Once you're set up, click Apply rules to start bliss scanning your music folder. It will check each album obeys the above rules. Note that by enabling the cover art rule you are also enabling the missing art rule. This is configured by the Saved artwork filename and Embed cover art in music files settings. If either are configured to store artwork bliss will source the artwork either from your own collection or online, and install it. You can avoid a separate file being created by "blanking" the Saved artwork filename field. Once an album has completed assessment, it will be marked as Compliant or Non-compliant. This defines whether the album is compliant according to your rule. For example, if artwork for a given album is larger than 256KB (given our example above), this album will be marked Non-compliant. You can check the exact reason by clicking the why? button next to each album. In the example to the right, bliss has assessed that the existing artwork is much larger than our target of 500x500 and the data size likewise. The artwork is JPEG though, so at least we get a compliant "tick" there. Underneath the assessment are buttons to fix the problems bliss has identified. There's a choice of reducing the data size, or the resolution. 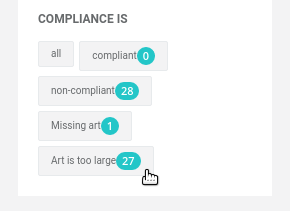 In this case, clicking either may influence the overall compliance (because reducing the size to 500x500, say, may also reduce the data size) and so bliss will re-assess the album after you click any one of these buttons. You can drill into more information about the assessment by clicking the text for each assessment. This will direct you to the Change art page where, as well as more detail, you get the option to replace with some artwork found online. That covers the basics. 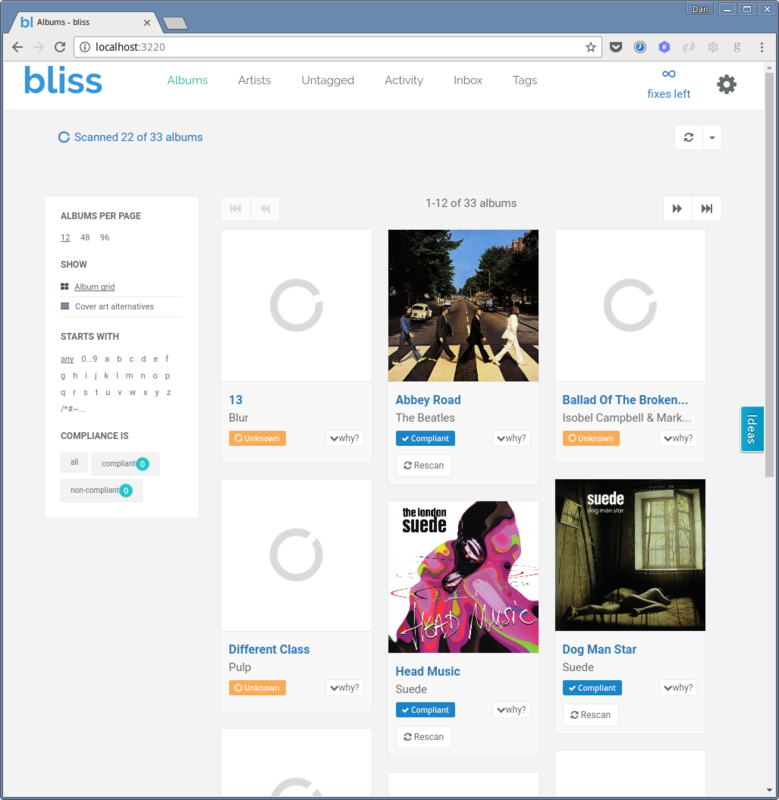 I hope you find bliss a useful tool to manage your music library and get it ship-shape. There's a lot more to discover! Thanks to andriuXphoto for the image above.